Changing the way brands attract, retain and interact with customers. The premium conference at Europe's Customer Festival is where expert speakers from world-renowned organisations will share the secrets of their success. Choose from 4 different conference streams and engage in 15+ hours of networking with top marketing professionals from the retail, ecommerce, telecoms, leisure, tourism and banking industries , and join the conversation where customer centric thinking will lead to new ground being broken. The most innovative marketing solution providers in Europe will be at our exhibition. They will have plenty to offer including giveaways, competitions, product samples and more. Not only that, but the exhibition will feature customer case studies and product demonstrations to inspire your marketing strategy. 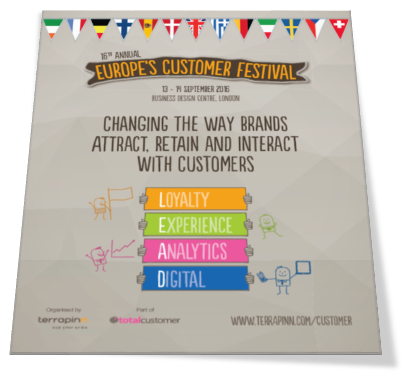 Take a look at what our attendees got up to at Europe's Customer Festival 2015.